"Yamal crater: what really is it?" 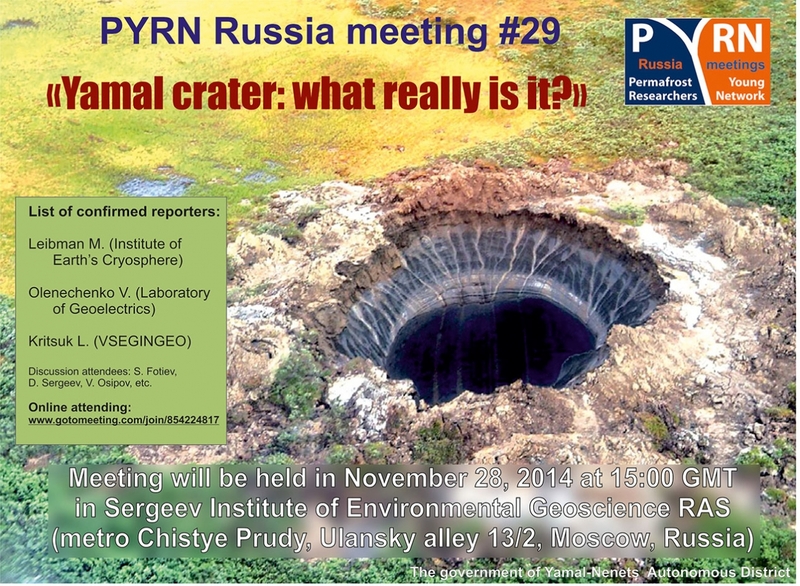 Yamal crater is a topic of scientific debate, held at Sergeev Institute of Environmental Geoscience RAS (IEG RAS) in framework of the Permafrost Young Researchers Network (Russian branch) meeting in Moscow. This was the first large-scale event to exchange ideas about the origin, structure and mechanisms of the crater formation. Permafrost, geophysics and geomechanics researchers (M. Leibman, A. Kizyakov, V. Olenchenko, L. Kritsuk, A. Reznikov, L. Kozhina, G. Kraev G. Postoiev, V. Pushkarev, A. Smirnov, I. Bogoyavlensky) reported on three expeditions (in July, August and November of 2014). Then scientists and experts, who observed what appeared to be a crater and simply indifferent to the mysteries of nature persons shared their ideas. There were a variety of hypotheses: from the explosion pingo to meteorite impact. Supposed a number of models of what happened. Until definitive conclusions still far away, but on November 28th, everyone could learn more about the crater and ask questions. Interest in the subject was so great that the audience of the meeting could not accommodate everyone. See you in next PYRN Russia meeting! Now PYRN Russia is preparing short report on the meeting with suggestions about origin of Yamal crater. Please, participate in our questionnaire (only Russian now) about this crater to be close to the truth! 1. Reconnaissance survey of gas-emission crater on the Yamal Peninsula: possible, unlikely and impossible versions of the origin. Leibman М.О., chief researcher, Earth Cryosphere Institute SB RAS, Moscow. Kizyakov А.I., senior researcher, Department of Cryolithology and Glaciology, Lomonosov Moscow State University, Moscow. 2. The results of complex geophysical research on the geological tumors - Yamal crater. Olenchenko V.V., senior researcher, Laboratory of geoelectrics, A.A. Trofimuk Institute of Petroleum Geology and Geophysics SB RAS, Novosibirsk. 3. Superficial manifestations of fluid and dynamic of Earth processes. Smirnov А.S., head of Engineering and Technical Center, Ltd. Gazprom Exploration, Tyumen. Nechdanov А.А., deputy, Engineering and Technical Center for Science, Ltd. Gazprom Exploration, Tyumen. 4. About the failure mechanism in frozen ground. Postoev G.P., chief researcher, Laboratory of Soil and Soil Mechanics, Sergeev Institute of Environmental Geoscience RAS, Moscow. 5. Expedition on a gas emission crater on November 5-11, 2014. Bogoyavlensky I. V., Institute of problems of oil and gas, Moscow. Pushkarev V.А., director, Russian Centre for development of the Arctic, Salekhard. Webinar was organized for colleagues from Russia (Novosibirsk, Irkutsk, Salekhard, Tyumen, Noyabrsk, Novokuznetsk, St. Petersburg, Moscow) and foreign countries (USA-Alaska, Norway, Germany, Belarus) using GoToMeeting platform (grateful to APECS and Yulia Zaika) and Skype. PYRN Russia meeting #29 was organized by Stanilovskaya J., Maslakov A., Tolstogan A., Zaika Yu., Kuznetsova A. Meeting will be available online: www.gotomeeting.com/join/854224817 with interactive presentation. Online participants could hear and attend the live discussion, see the power points slides and interact via chat box with the presenter the entire time. You will be connected to audio using your computer's microphone and speakers (VoIP). A headset is recommended. PC-based attendees - Windows 8, 7, Vista, XP or 2003 Server, Macintosh-based attendees - Mac OS X 10.6 or newer, Mobile attendees - iPhone, iPad, Android phone or Android tablet. Leibman М.О., chief researcher, Earth Cryosphere Institute SB RAS, Moscow. Reconnaissance survey of gas-emission crater on the Yamal Peninsula: possible, unlikely and impossible versions of the origin. Olenchenko V.V., senior researcher, Laboratory of geoelectrics, A.A. Trofimuk Institute of Petroleum Geology and Geophysics SB RAS, Novosibirsk. The results of complex geophysical research on the geological tumors - Yamal crater. Krizuk L.N., leading researcher, All-Russian Research Institute of Hydrogeology and Engineering Geology, settl. Zeleny. The nature of the Yamal crater. Cherkasov V.А., chief researcher, Laboratory of Natural Hazards, Gazprom VNIIGAZ LLC, Moscow. Chuvilin Е.М., docent, Department of Geocryology, Lomonosov Moscow State University, Moscow. Dauboin P., Director of Research and Development, Total E&P Russie, Moscow. Khimenkov А.N., leading researcher, Permafrost Laboratory, Sergeev Institute of Environmental Geoscience RAS, Moscow. Kizyakov А.I., senior researcher, Department of Cryolithology and Glaciology, Lomonosov Moscow State University, Moscow. Kornienko S.G., head of Laboratory of Aerospace Methods, Institute of Oil and Gas Problems of RAS, Moscow. Kozina L.Yu., head of Laboratory of Natural Hazards, Gazprom VNIIGAZ LLC, Moscow. Kraev G.N., senior researcher, Centre for Ecology and Productivity of Forests, Moscow. Mamaev Yu.А., leading researcher, Laboratory of Soil and Soil Mechanics, Sergeev Institute of Environmental Geoscience RAS, Moscow. Miklyaeva Е.S., senior researcher, Hydrocarbons Reserves and Resources Centre, Gazprom VNIIGAZ LLC, Moscow. Nechdanov А.А., deputy, Engineering and Technical Center for Science, Ltd. Gazprom Exploration, Tyumen. Osipov V.I., academician, director at Sergeev Institute of Environmental Geoscience RAS, Moscow. Postoev G.P., chief researcher, Laboratory of Soil and Soil Mechanics, Sergeev Institute of Environmental Geoscience RAS, Moscow. Pushkarev V.А., director, Russian Centre for development of the Arctic, Salekhard. Rivkin F.M., head of Department of Engineering and Permafrost survey and GIS technologies, OJSC Fundamentproject, Moscow. Sergeev D.О., head of Permafrost Laboratory, Sergeev Institute of Environmental Geoscience RAS, Moscow. Smirnov А.S., head of Engineering and Technical Center, Ltd. Gazprom Exploration, Tyumen.